And a new begin here at Where Is My Spoon. Why? I needed a new idea, something to renew my energy and motivation, something to challenge me more in the kitchen, to give me the possibility of learning new things on a more regular basis and to be able to share them as well. Why now? Well, I have been thinking about the need of bringing something new to my blog for a while now, but didn’t really know what. There were many things, ideas going in and out of my mind, some things about which I spent an hour thinking and then again things that occupied my mind for weeks at a time. I felt the need of finding a new direction, a new focus or better said A FOCUS, I often felt that my blog was a bit about this and a bit about that and I wanted to give it a bit more structure, not only for the readers but also for me. It was not always easy for me to pick a recipe I want to publish, because I wasn’t always sure what fits at what moment and so on. What? I have decided to choose two themes every month and to focus on sharing recipes according to these themes. One theme every month will concern a vegetable or fruit that happens to be in season during that time and the other one will be more flexible, for example how to make sourdough and sourdough bread recipes or different types of cheese cakes or German soup recipes and so on. The possibilities are endless. And I would definitely not mind taking suggestions, so if anyone would like me to explore one special thing, I would love to hear about it. Broths and stocks. First of all, let’s start with the difference between them. To tell you the truth I didn’t really know there was a difference before I started reading about it. I’ve always though the terms are interchangeable and I’ve used them like that until recently. But now I know a broth is the liquid obtained when cooking vegetables or/and meat in water, for a quite short period of time, something between 45 minutes and about 2 hours. The result will be a light liquid, which can be used as a basis for soups including other ingredients. A stock is the liquid obtained when cooking vegetables and bones with some meat on them for a longer period of time, something between 4 and 6 hours. This is the version I make most of the times, usually with chicken and sometimes with beef. The result is a very flavorful liquid, which can also be used as a base for soups but also for gravies. The stock jellies when chilled and this is due to the extraction of the collagen from the bones and the connective tissues. And then there is the bone broth. A term I’ve only discovered recently although I have been making some kind of bone broth for years. I had never cooked the bones for quite so long but still it was something very similar in consistence and taste. A bone broth is made of bones, usually roasted, with no or at least not very much meat attached. The bone broth is cooked for a very long time, at least 12 hours, usually longer. There are people who use their slow cooker to cook some kind of perpetual bone broth, where they add more vegetables and bones every day. The bone broth is extremely nutritious, this long cooking time allows not only the extraction of the collagen out of the bones but also of all the minerals that the bones contain. 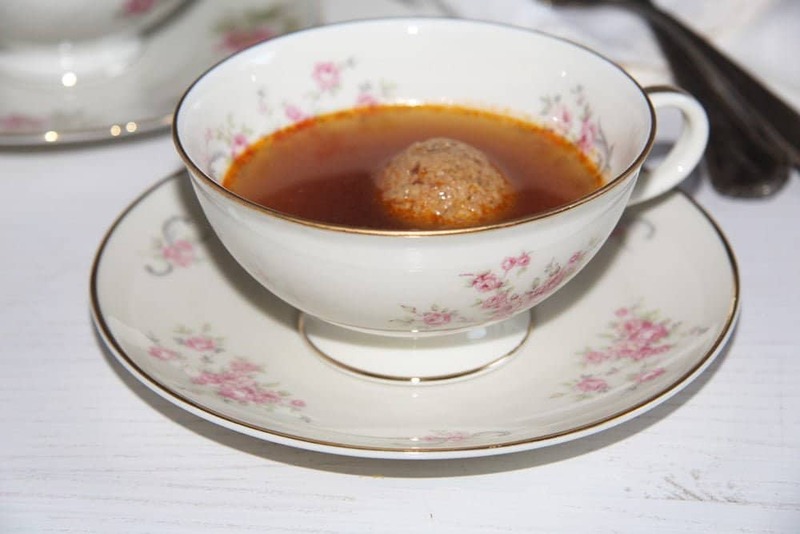 In the case of the vegetable broth that I will share with you today the term stock or broth is interchangeable. There are no bones or meat involved, so I guess it doesn’t really matter how you call it. Vegetable broth is something that I have been making on a regular basis for years now, mostly to use it for light vegetable soups. I don’t really bother to cook vegetable stock unless I want to make a really nice veggie soup. But then, when I cook it, I make sure to cook more than necessary. I use parts of it for the soup and I either keep the rest in the fridge for about a week or freeze the rests in smaller portions to use for other purposes. Trust me, over the years I have tried many many ways of making vegetable broth. Some I liked, some I found a waste of time and energy. I have made this roasted vegetable broth for the first time a few years ago and I have to say that it is my absolute favorite. None of the other was ever so rich and flavorful as this one, by the looks of it you could even think there is meat involved. 🙂 But there isn’t. Just lots and lots of different veggies, roasted in the oven and then cooked for quite a while with lots of spices. The resulting broth has truly a very rich, kind of sweet taste. To balance this sweetness I like to add some lemon juice or vinegar in the soup, right at the end. 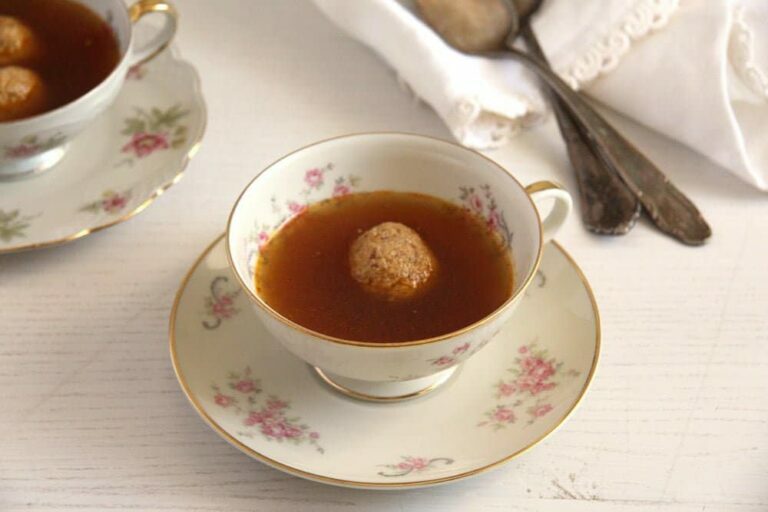 I normally use lemon juice when I make a light soup like the one with the hazelnut dumplings and go for vinegar when making a heartier soup with lots of vegetables and potatoes or beans etc. You can add just about anything in the finished broth: vegetables and noodles and all sorts of dumplings. For today I chose these hazelnut dumplings/balls made with ground hazelnuts and dried breadcrumbs. They are a perfect choice for a fancier first course soup, I would say, at least this is how I mostly serve them. If your onions, carrots and parsley roots are organic, don’t bother peeling them, just wash them very well. If you cannot find parsley roots, you can replace them with more celeriac, parsnips or turnips. I use the stems of herbs to give the soup more flavor. In order to have enough of them when I make the broth, I always freeze the stems of the herbs I use for other recipes. I have a plastic bag in the freezer, where I keep all the stems occurring during cooking. Every two or three months I have a bag full of the stuff. If using organic onions, carrots and parsley roots, you don't have to peel them, just wash them well. Quarter the onions. Chop the peeled celeriac, carrots, parsley roots, tomatoes and bell peppers into large chunks of roughly similar size. Place them on two baking trays lined with baking paper, divide the olive oil between them and mix everything well. Roast for about 45-60 minutes, stirring every 15 minutes, until the veggies are soft and starting to brown around the edges. When ready place all the vegetables in a very large pot, add the water and all other ingredients. Bring to a boil, turn the heat down and simmer, uncovered, until reduced by half. It takes between one and a half and two hours. Strain through a fine mesh sieve and again through a fine, clean cloth if you wish the broth to be free of every residue. Place in a clean pot, bring to a boil again and add salt and pepper to taste. If you want to keep some in bottles, fill it in clean jars or bottles while very hot. Put the lid on, let cool and keep in the fridge. Or you can leave it in the pot until cold, fill it in smaller containers and freeze. To make the hazelnut dumplings: whisk the very soft butter and the eggs until frothy. Add the hazelnuts, breadcrumbs, lemon juice, nutmeg and salt to taste and mix well. Leave to stand for about 10 minutes. Form small balls, about the size of a walnut. Bring about 1 liter/ 4 cups vegetable broth to a boil, turn the heat down and simmer the hazelnut dumplings for about 6 minutes. Adjust the taste with salt, pepper and some lemon juice. I think your idea to focus on a topic for a few posts is a great idea! Can’t wait to see the stock/broths and add ins you come up with! LOVING this roasted vegetable broth! The hazelnut dumplings sound delicious! Absolutely perfect for this time of year! Cheers, my dear! That is a great idea to do monthly themes for the blog! What a great opportunity to really dive into the subject matter. I love having homemade broths on hand, but I don’t make them as often as I would like! Love this recipe for vegetable broth, I need to make some of this asap! Thank you, Meghan. I hope you try the vegetable broth. And it really involves some learning when getting a bit deeper into a subject. I’ve learned so much about broths and stocks already and been making things I haven’t made before like fish broth for example. It’s a great idea to develop themes for your posts. I can see how having a direction as to what type of dish you are going to make can reduce the stress of planning. Too often I find myself spending an excessive amount of time brainstorming about what to make in an effort to pick a dish that “felt right”only to reject one idea after another. I hope the new format works out beautifully for you! I love soups that are all about the broth, and this broth looks so rich in flavor. The hazelnut dumplings are something new or me, but it sounds so good! Thank you, Thao. It is such a relief to have everything in mind a couple of months in advance. I can concentrate better on developing the recipes, trying one several times to make her exactly how I want it to be, I can schedule the posts better, it really works better for me already. Hazelnut dumplings…this is new to me. It must be very delicious, Adina. I love that roasted veggie broth. I never heard of hazelnut dumplings! I love nuts, so I’m sure I’d like those dumplings, they are also healthier than the meat ones! For sure healthier and they taste goooood! I always helps to have a goal, doesn’t it? Love this soup! Didn’t know about hazelnut dumplings, how fun! It does help, I feel so much better now that I know what’s coming next. This is a great idea! Stocks and broths are so important to cooking so many things, so I love that you’re focusing on them in February! Monthly theme on blog is such an amazing idea, Adina. Absolutely love this gorgeous soup. Can’t wait to see you broth collection. Love your new theme-focused months. I know what you mean about needing a focus or something to motivate you or get your excited. It’s not only an interesting way to blog for your readers but it’s great if it energizes you. 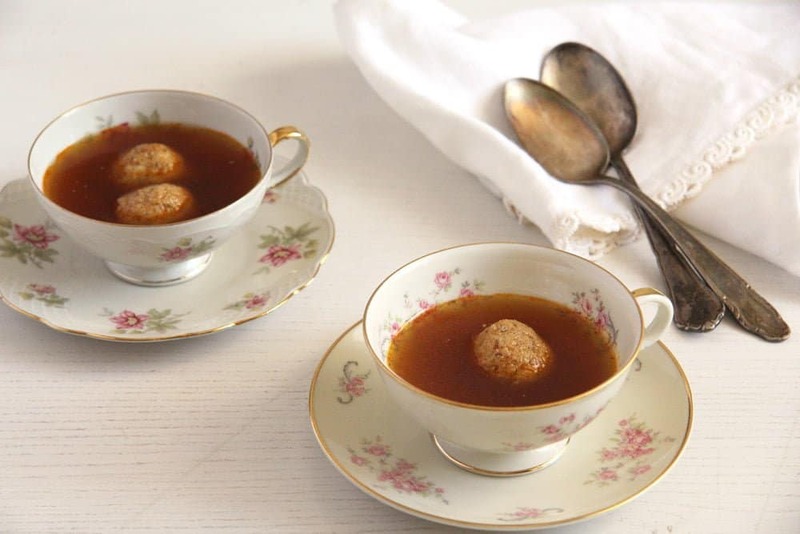 I could just guzzle down soups and broths and I’m really mesmerized by the idea of hazelnut dumplings! Lots to learn!! Thanks for the recipe, I will definitely give it a try!